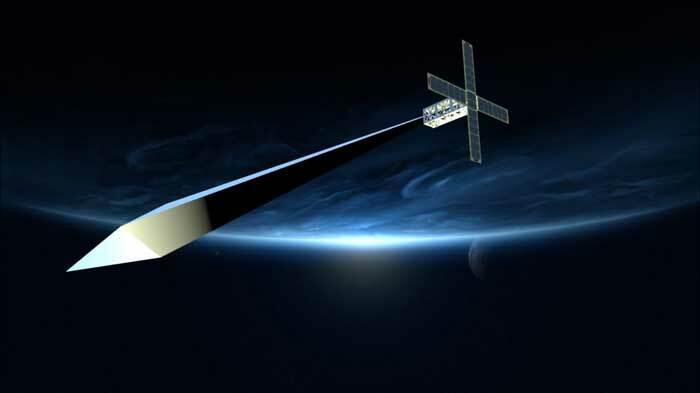 Design concept rendering for Trevor Paglen: "Orbital Reflector," coproduced and presented by the Nevada Museum of Art. Courtesy of Trevor Paglen and Nevada Museum of Art. 2017, Courtesy "PBS News Hour"
A PBS Newshour article details Trevor Paglen's (MFA 2002) Orbital Reflector, a sculpture to be launched into space from Vandenberg Air Force Base, California in mid-November. Partnering with the Nevada Museum of Art, Paglen took into account light intensity, the duration of time the object will be in space for, and the technology best suited to achieve these. A Kickstarter combined with several sponsors raised $1.5 million, which went toward fabrication and launch costs, according to Amanda Horn, director of communications at Nevada Museum of Art. Like any other object sent into orbit, the project has to go through an extensive licensing process. The sculpture had to comply with International Traffic in Arms Regulations, the Federal Communications Commission (FCC) and the US Air Force, and other wide-ranging international and national standards. A week prior to the publication of the PBS Newshour article, the project was given a license by the FCC to send details about frequency to the International Telecommunications Union and the FCC, in compliance with International Radio Regulations.